Family-owned Heming Group has invested heavily in new plant and tractor equipment as it consolidates its position as a leading player in contracting and civil engineering. The company – based in Willersey, near Broadway – has acquired additional excavators and tractors to cope with a surge in business as it nears 50 years of trading. The new top-of-the-range additions to its extensive fleet of vehicles are a Doosan DX 140 LCR reduced tail swing crawler excavator and a Doosan DX 225 LC crawler excavator, which has established itself as an all-round machine for residential to mid-sized building contractors and civil engineering jobs. The other two new arrivals are a Terex TLB 890 PS wheeled digger and a powerful JCB Fastrac 422200 tractor (pictured). The equipment is a boost to Heming Group’s standing at a busy time in its history which has seen it win a number of major contracts including providing groundworks for new care homes in Evesham, Worcestershire and Sutton Coldfield, West Midlands. Heming Group, which has more than 40 employees, comprises Heming Civil Engineering and Construction, Heming Agricultural and Plant Engineers, Ford Electrical, Major Refrigeration and Air Conditioning Services and Major Building Services. Peter Heming, Managing Director of Heming Group, said: “This investment in new equipment demonstrates our commitment to being a leading operator in a fiercely competitive marketplace. 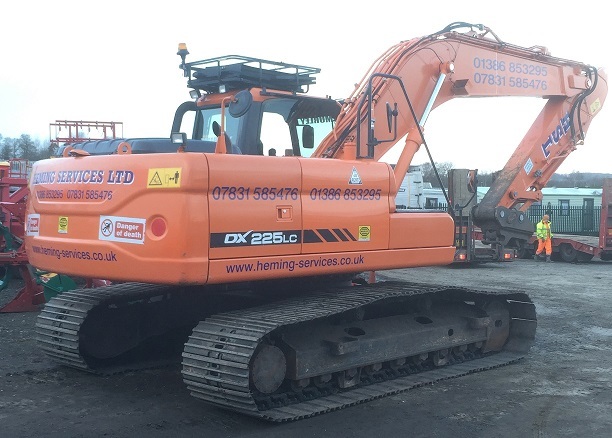 Heming Civil Engineering and Construction Contractors has extensive experience in providing groundwork, construction and civil engineering services to clients across the midlands and south west. With a wide range of equipment at its disposal, the company can work on all sizes of site from household groundwork to large construction sites. It can carry out all infrastructure groundwork up to DPC (damp-proof course) for developers.